As the Stanley Cup Playoffs are underway, the price of playoff tickets in rising across the league on the secondary market. The average playoff ticket for each team is at least 50% higher than the average price for home games during the regular season. While there is a general increase across tickets for the playoffs, a select few teams have tickets on the secondary market cheaper than the lowest priced ticket at face value. St. Louis begins the Blues playoff schedule and their push for the Stanley Cup on Thursday against the Chicago Blackhawks, and fans looking to see their team at the Scottrade Center will find the league’s largest difference between face value and secondary ticket prices. 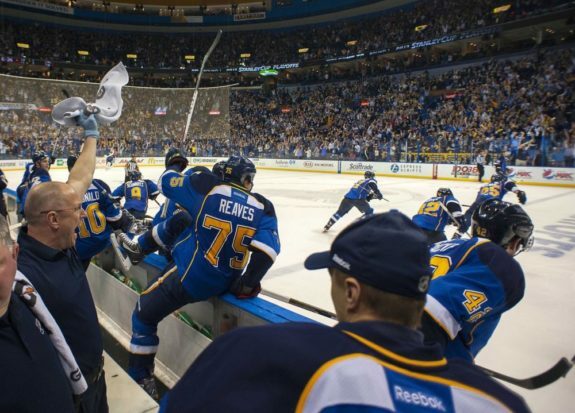 The cheapest face value price for a St. Louis Blues first round playoff ticket is $78.15 while secondary prices can be found for as little as $63, making the secondary price undervalued by almost 20%. Bruins tickets have some of the highest prices on both the primary and secondary markets. The Bruins will look to reach the Finals for the second straight year and will face the eighth seed Detroit Red Wings in the first round. The cheapest face value price for first round on the Bruins playoff schedule is $155.95 with the cheapest secondary price set at $129, marking a 17.28% difference between face value tickets and the secondary market. Under the lead of captain Joe Thornton, the San Jose Sharks will match up against the Los Angeles Kings in the first round. The cheapest face value tickets will be $76.75 while the cheapest secondary price can be found at $67. Sharks playoff tickets also have the second lowest secondary market average for first round games in the playoffs. Compared to the other teams on this list, Anaheim Ducks playoff tickets are a steal. The cheapest face value for first round Anaheim Ducks playoff tickets will go for $28, marking a 10.71% difference in price between cheapest face value and the secondary market. Even with games already played on the Ducks playoff schedule, this type of deal still remains. Average prices for first round games may be high across the league, but the cheapest Blues, Bruins, Sharks and Ducks tickets will get fans into the game at the lowest possible prices to experience the most exciting time of the hockey season.